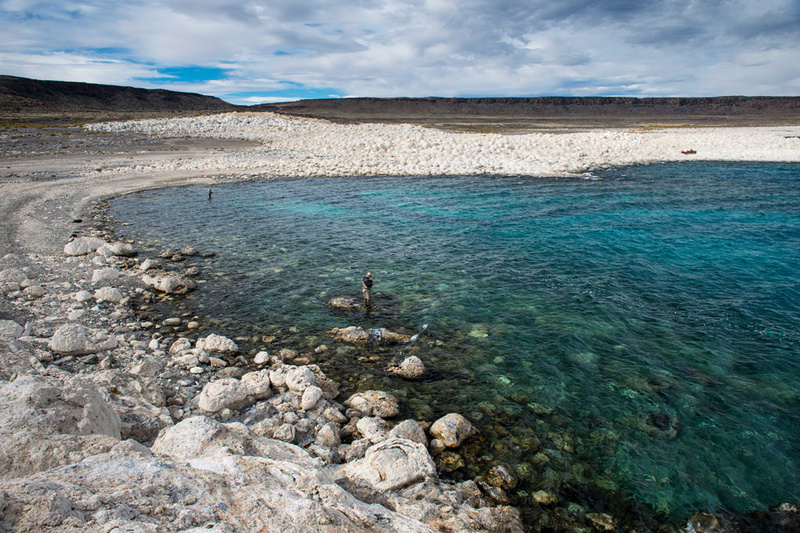 Jurassic Lake, Argentina | Tailwaters Fly Fishing Co.
Anglers from North America travel overnight to Buenos Aires (EZE), transfer to the domestic airport (AEP) for a connecting 2.5 hour flight to El Calafate with Aerolineas or Lan Airlines. 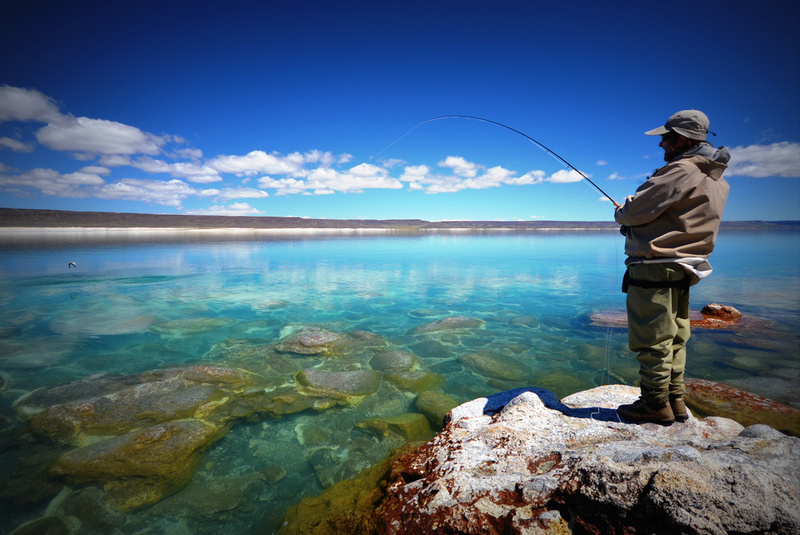 From Calafate, anglers are transferred by ground approximately five hours to the Estancia. Many travelers elect to spend at least one night in Buenos Aires on the front end to enjoy the city. All guests also spend Friday night in Calafate before pushing on to the lodge Saturday morning. Our concierge service and travel agents in Buenos Aires will assist with ground transfers, tours, hotel reservations, and domestic airfare with the local airlines. The Jurassic Lake system is loaded with GIANT rainbow trout. Fishing with small nymphs and scuds is the traditional method of fishing on the lake itself, while dead drifting large, foamy dry flies or even skating a mouse in the Barrancoso river are the norm. Anglers interested in incorporating the Barrancoso and Moro rivers into the fishing program should consider November, December and March, April as the best months for sight fishing in these river systems. Is Jurassic Lake Right For You? Lago Strobel, or “Jurassic Lake” is certainly not a destination for everyone. It is located in one of the world’s most desolate and harsh landscapes in the absolute middle of nowhere . 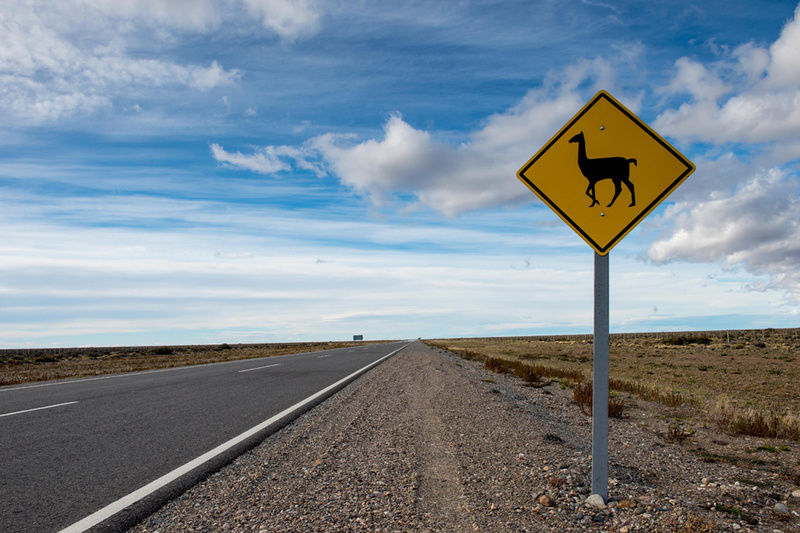 . . the Santa Cruz Province of Southern Argentina. 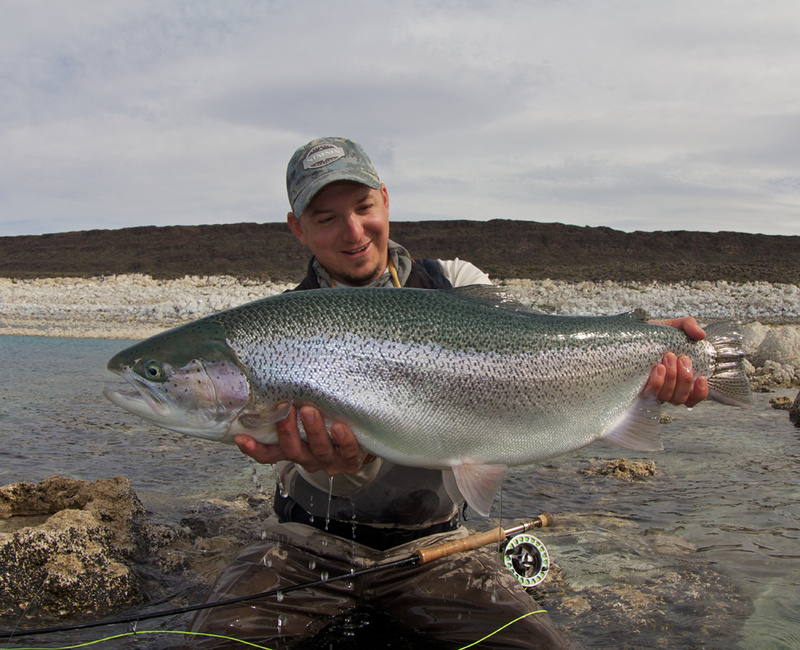 Intrepid anglers willing to make the journey and deal with the harsh elements are rewarded with the most ridiculously amazing trophy rainbow trout fishing in the world! It is a physical trip in rough country and windy conditions are the norm – so casting skills must be up to par. Shorter week itineraries available upon request when available. Additional expenses include airfare to El Calafate, hotel accommodations in El Calafate Friday night, gratuities, $160 Argentine Reciprocity Tax and expenses in Buenos Aires when applicable. See RATES for details. 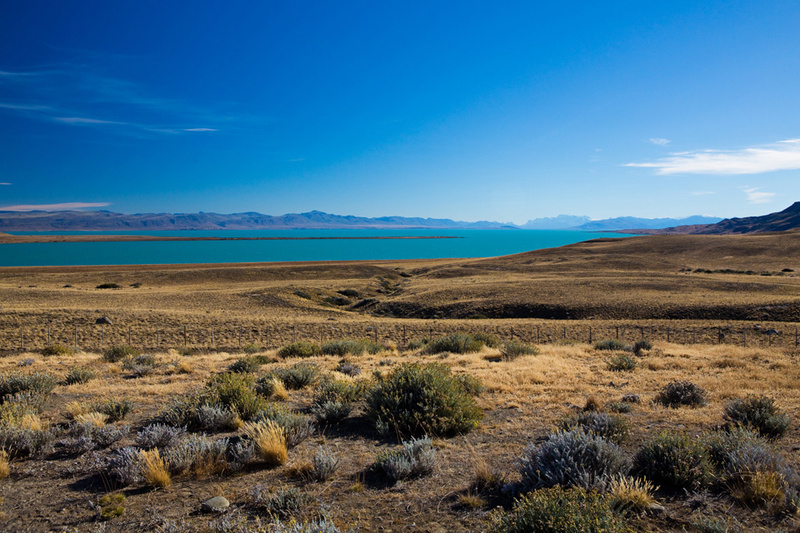 Estancia Laguna Verde on Lago Strobel, or “Jurassic Lake” is located approximately 4.5 hours from the closest airport of El Calafate, Argentina . . . right smack in the middle of nowhere! Jurassic is a massive lake stocked decades ago with rainbow trout that have evolved to enormous sizes feeding on the presence of huge scuds and baitfish. It is a one of a kind destination where the average sized rainbow weighs in at a solid ten pounds, and fish exceeding twenty pounds are landed each season. Guests at Laguna Verde enjoy the world-class fishing on Lago Strobel as well as private access to Moro creek and another dozen smaller lakes on the property – all loaded with huge rainbows. Exclusive access to the Barrancoso River is also a tremendous bonus for anglers when fish congregate . . . often yielding excellent sight casting opportunities for these dinosaur-sized rainbows on foamy dry flies. Estancia Laguna Verde is the only traditional lodge near Jurassic Lake. Whereas competitors operate tent camps on the shores of the lake, guests at Laguna Verde enjoy all the amenities expected at a proper fishing lodge. In addition to five spacious bedrooms with private baths, the lodge has a lovely dining room and bar, outdoor wooden deck, and a wader drying room. Although we recommend you bring your own equipment, the lodge has a modest fly shop with some flies, leaders, waders, and fly rods, reels and lines available for purchase or rent. This is the type of destination that comes around once in a lifetime. Estancia Laguna Verde is located in Southern Argentina, a few hundred miles north of Tierra del Fuego. It is extremely desolate and rugged country, way off of the beaten path. The closest airport is in El Calafate (population 6200), in the Patagonian province of Santa Cruz, and a 4.5 hour drive from the lodge. Although Santa Cruz is a popular tourist destination in Patagonia for adventurous tourists, travelers head out to Estancia Laguna Verde for one reason only . . . the biggest rainbow trout on the planet. Lago Strobel, also aptly known as “Jurassic Lake,” is a sixty-five square kilometer lake stocked decades ago with rainbow trout that have evolved to enormous sizes feeding on the presence of huge scuds and baitfish. It is a one of a kind destination where the average sized rainbow weighs it at a solid ten pounds, and fish exceeding twenty pounds are hooked and sometimes landed each season. There is quite simply nothing like it. Estancia Laguna Verde has virtually exclusive access to this incredible resource along with fifteen other smaller, impressive lakes, a smaller creek, and a traditional freestone river on their private property that diversifies the angling experience. Jurassic Lake truly is something special, a fishery that has quickly earned its reputation as the most prolific rainbow trout fishery on earth. This natural stillwater with its 15-mile shoreline, ocean-sized swells and breathtakingly clear blue waters is a natural phenomenon, and until relatively recently, free of any trout. In the few short years since their introduction, the lake’s rainbows have quickly reached massive proportions, due largely to the lake’s staggering population of freshwater scuds. Trout in the 6-12 pound category are simply average, and fish in excess of 20 pounds are seen here on a fairly regular basis (seen, but only rarely landed!). 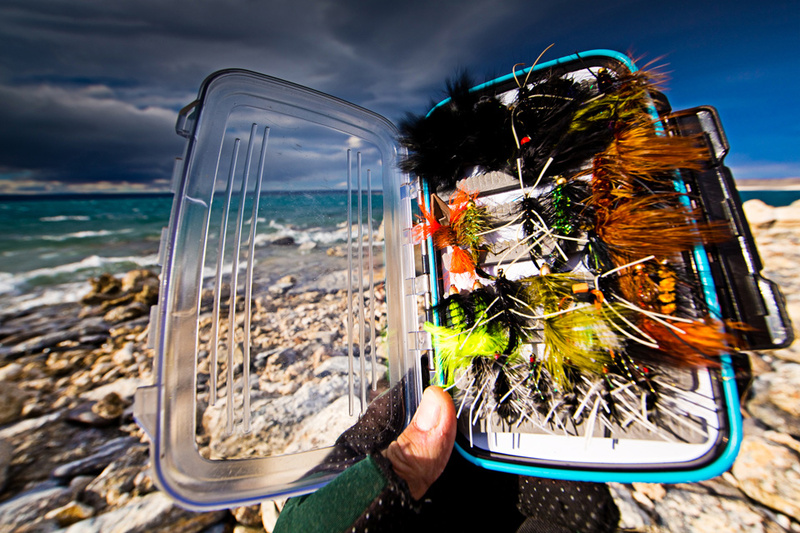 Unlike steelhead or sea-run brown fishing, where anglers consider a couple of fish landed per week a success, Lago Strobel and the surrounding lakes and rivers offer a six month season (November – April) for uneducated and cooperative rainbows. Estancia Laguna Verde operates an elaborate program using trucks, four wheelers, and boats to access all the “coasts” of Logo Strobel as well as fifteen smaller lakes, a proper freestone, and a smaller creek on the ranch. The lodge also has access to “Monster’s Bay” on Lago Stobel, which is considered the best fishing on the lake. All of the fishing is reached within 10-30 minutes by truck and/or four wheelers. It can be VERY windy in this part of the world, however the lake is situated where it is easy to find wind at your back. Anglers need to be prepared for windy conditions and some physical hiking involved with a full day on Jurassic. The fishing program is very civilized, yet the schedule is quintessentially Argentine. Reasonable wake up calls, long days on the water, a siesta and late lunch, and a 10:00PM (at the earliest) dinner are part of the typical day. When fishing the smaller lakes and rivers, anglers usually return to the Estancia for lunch and a siesta, while Jurassic Lake anglers spend the entire day away from the lodge. Lunch is taken at a lakeside cabin. 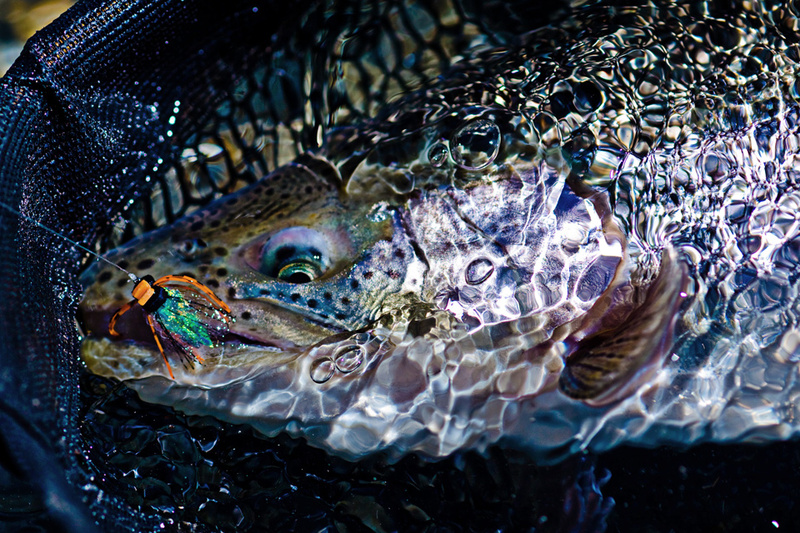 Eight or nine weight rods and a combination of floating and sinking lines are required for landing these monster bows in the lakes, while 5-7 weight rods can be used in the rivers if preferred. Spey or two handed casters also enjoy the wide open space and the opportunity to make long casts on the lake as well. The only river system that is actually connected to Lago Strobel is the Barrancoso River… and Estancia Laguna Verde has exclusive access. 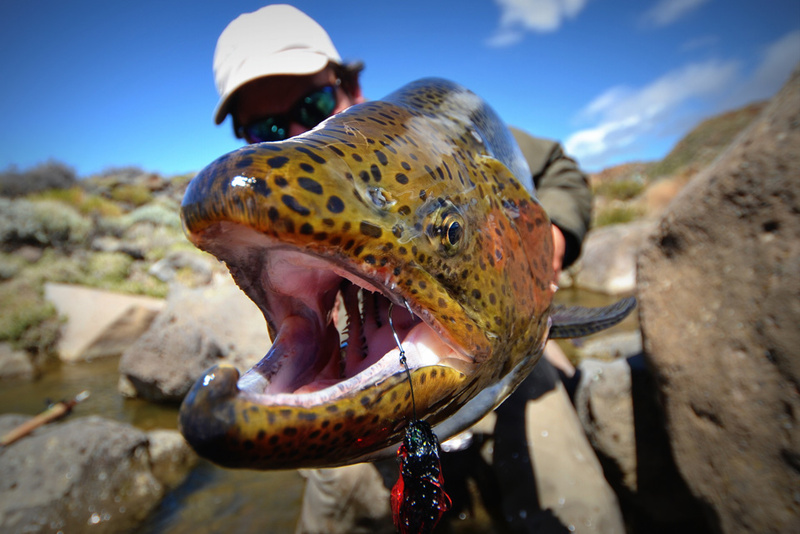 The early and late weeks (November/December and March/April) can be particularly attractive for those wanting to catch big trout in the Barrancoso River, as the stream often runs a bit higher (and with a glacial tint) due to runoff and/or rainfall during these months, allowing the largest lake rainbows to run far upstream, populating many of the miles of pools. During the middle months the stream shrinks dramatically, with sight fishing for trout in the 6-15 pound range an unreal visual experience, sometimes even on skated mouse patterns! The smaller lakes are not to be overlooked as they offer an incredible alternative to Jurassic when it is super windy or you want some nice dry fly fishing in the evenings. The Estancia house overlooks Lago Verde, which is chalk full of 5-10 pound rainbows, and is a great spot to fish unguided following a day on Jurassic if you have not had enough. One of the lakes is affectionately known as “Lago Texas” after Dr. Dan Bolin of Wichita Falls, Texas brought his kick tube down and tagged nearly one hundred rainbows one afternoon! Also on the property is Moro Creek, which connects the smaller lakes and offers a traditional spring creek style trout fishing often with dry flies during the early and late season. The five bedroom (three singles and two shared) Estancia House sits on a small bluff overlooking Laguna Verde Lake. The accommodations are incredibly sophisticated given the remoteness of their location. In addition to spacious bedrooms with private baths, the lodge has a lovely dining room and bar, outdoor wooden deck, and a wader drying room. Although we recommend you bring your own equipment, the lodge also has a modest fly shop with some flies, leaders, waders, and fly rods, reels and lines available for purchase or rent. The facility is also equipped with wireless internet as well as satellite television and telephone. Meals are traditional Argentine with lots of beef, lamb, and of course asados (Argentine BBQ) and incredible wines from Mendoza, Nequen, and other popular wine growing regions of Argentina. The service, comfort level, equipment, vehicles, and organization of the Laguna Verde operation is on par with top tier lodges found anywhere…a real feat considering the logistical challenges of its remoteness. Guests travel to Buenos Aires via direct overnight flight from several U.S. cities including New York, Miami, Houston, and Dallas/Ft. Worth International airports — arriving into Buenos Aires the following morning. Guests traveling straight through then gather their luggage, clear customs, and are met by a driver who transfers the group across town to the Domestic Airport (AEP) for the flight to El Calafate. You must arrive into El Calafate the Friday night prior to the Saturday ground transfer to the lodge. Some travelers elect to arrive in Buenos Aires on Thursday and spend the day and evening there prior to departing for El Calafate on Friday. If you have the time, B.A.’s nightlife, restaurants, museums, culture, and shopping are well worth the effort. This is a great way to break up the two legs of the journey, do some sightseeing, and recharge your batteries. Tailwaters uses a very reliable local travel agent who lends a hand with domestic airfare as well as customs assistance and chauffeur service that provides ground transfers for all our clients in Buenos Aires. They can also facilitate reservations at all the nicest hotels in Buenos Aires, and can also lend a hand with restaurant reservations, city tours, and other side trips. 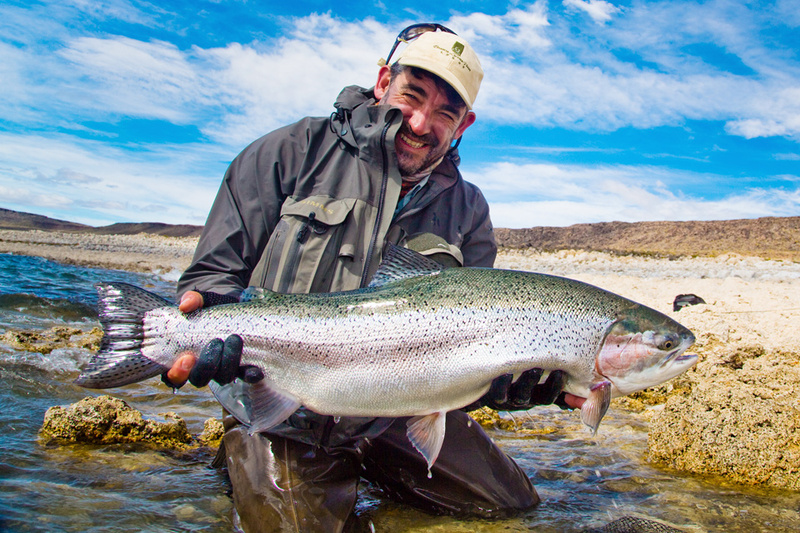 Once in Calafate, anglers arriving Friday afternoon spend one night in a local hotel and are met by a representative from Laguna Verde on Saturday morning and driven approximately 4.5 hours to the lodge. Gaia and LOL Argentina is our recommended choice for assistance in Buenos Aires. In addition to booking your domestic flights in Argentina, one of the many services LOL provides is complete airport assistance, which is invaluable for most non-Spanish speakers. Gaia and her staff provide meet and greet services at the international and domestic airports, informative transfers within the city, assistance checking in at airports, solutions to delayed flights, and can perform miracles at times with any other issues that might arise. If you use LOL’s service, you can also think of them as your personal concierge to the city of Buenos Aires. They can recommend and make dinner reservations, get you tickets to events, show you around the city, take you shopping (or shop for you), change local currency (for a better rate), answer questions, or just enjoy a drink and get to know you. Please count on Gaia and her staff to provide you with a memorable experience in Buenos Aires. None of LOL’s services are included in the price of your trip to Laguna Verde, and we will make all intros with LOL and assist in making all these arrangements. Estancia Laguna Verde operates on a Saturday – Saturday weekly itinerary. 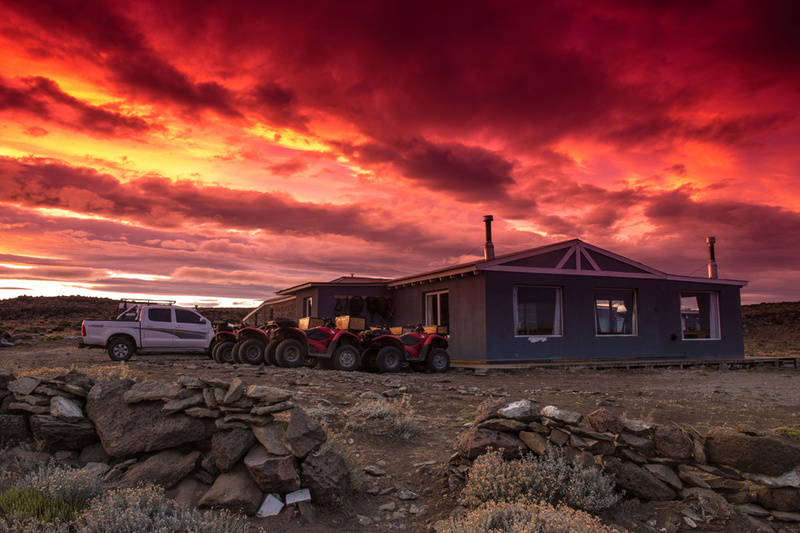 Guests who cannot get into Calafate early Saturday morning MUST PLAN ON SPENDING THE FRIDAY NIGHT BEFORE THEIR SATURDAY TRANSFER TO THE LODGE IN CALAFATE. 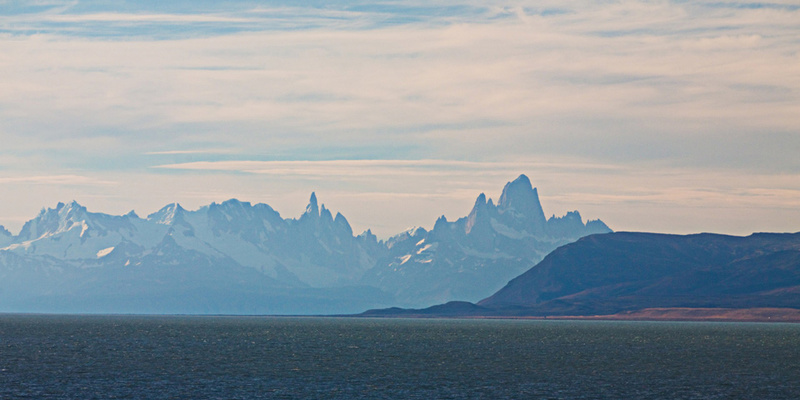 Travel to El Calafate (FTE) can easily be accomplished in one day with a connection in Buenos Aires. We will arrange for overnight accommodation in Calafate. Arrive Buenos Aires (EZE) mid-morning on flight from USA. Tailwaters has professional tour guides and speak perfect English. Don’t hesitate to ask questions about Buenos Aires and Argentina. They are very friendly and extremely informative. You will then be escorted by van and transported approximately two hours across town to the domestic airport (AEP) and your connecting flight to El Calafate. Depending on your itinerary, there is usually time for lunch and a brief tour of Buenos Aires before pushing southward. Note: There are often domestic flights to Calafate from the international airport (EZE). It may be possible to have a straight connection in Buenos Aires without switching airports. 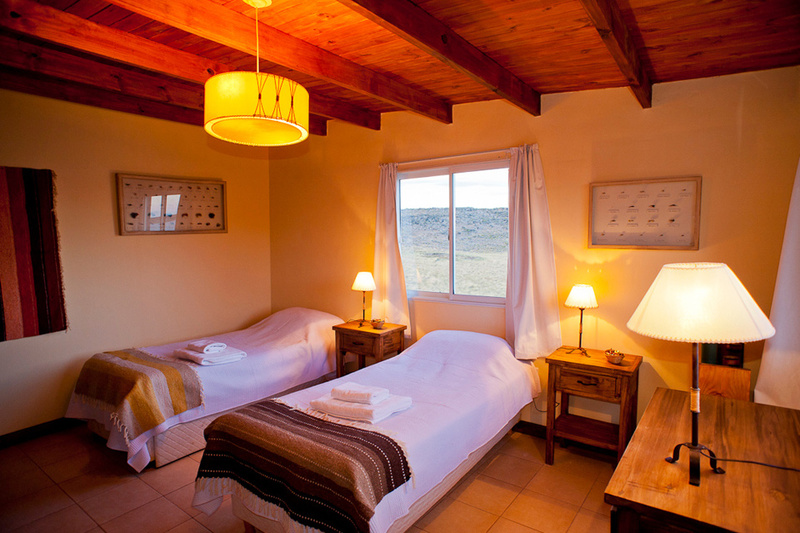 Upon arrival in El Calafate, you will be escorted to a local hotel for overnight. You will be met at your hotel and driven approximately five (5) hours to Estancia Laguna Verde. 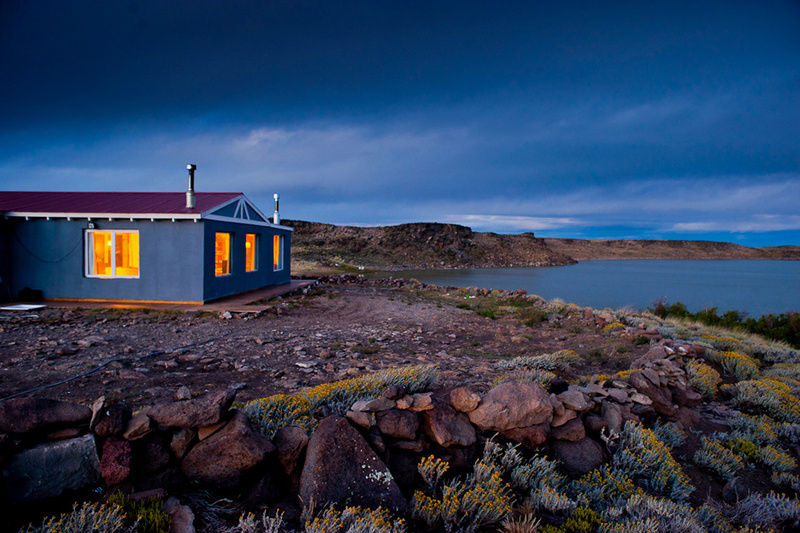 The lodge is located 200 miles from Calafate. The road(Highway 40) is paved with comfortable asphalt for 170 miles prior to changing routes at Cardiel Lake. The remaining thirty miles are through private ranch roads, and the last 13km of the trip is painfully slow as the driver must negotiate volcanic rock on the road. There is no guided fishing on arrival day, however guests are welcome and encouraged to string up a rod and go fishing in Lago Verde in front of the lodge if time permits. Overnight at Estancia Laguna Verde. Enjoy six full days of guided fishing on Jurassic Lake as well as other lakes on the property with continued overnight at Estancia Laguna Verde. A typical day will start with breakfast at 7:00 a.m. You will be fishing around 8:30 a.m. after a 30-45 minute drive to the fishing area for the day. Lago Strobel is located approximately thirty minutes from the lodge (20 minutes by truck and 10 minutes by atv). It is a beautiful ride down the Barranosco Valley to the caldera rim and a steep descent to the lake. When fishing Jurassic Lake and the lower Barranosco River you will break for lunch and a siesta at 1:00 p.m. at the cabin near monster bay. If fishing other lakes or streams on the Estancia, you have the choice of going back to the lodge or eating lunch by the river or lake. There will be a coffee-snack break at 4:30 p.m. and then fishing until the end of the day. Dinner will be served around 10:00 p.m. This is the standard dinner time in Argentina. Anglers fish two to a guide. You will be driven back to the airport in Calafate and assisted through check-in for your flight to Buenos Aires. Upon arrival in Buenos Aires, you will follow a similar procedure awaiting your escorts and ground transfer back to the International Airport. They will once again find you in the baggage claim area or just beyond the baggage claim in the main terminal. They will be holding a sign with your name on it. Travelers will then be transferred back to the International Airport, assisted through all the security and check-in procedure and issued boarding passes. Shorter week itineraries are available at Jurassic on a case-by-case basis. However, the lodge prefers to operate the 4 night / 3 day trips Saturday – Wednesday or Tuesday – Saturday. The 4 night trips are a wonderful add-on to compliment a full week with Patagonia River Guides up north or at a sea-run brown operation in Tierra del Fuego. Please ask for details. Estancia Laguna Verde enjoys a wonderfully long season from November – April. The there is really no “best” time to partake in the lake fishing, as it fishes consistently for the six months the lodge is open. Those interested in the river fishing should concentrate their efforts in the November/December and March/April time frames…and full week trips are encouraged during this time. As with all low latitude, mountainous regions, weather in Argentine Patagonia is very unpredictable. Jurassic Lake is near Tierra del Fuego, the end of the South American continent. Although warmer days can occur during the height of summer, anglers should come prepared for temperatures ranging from 30-80 degrees nearly all season long. Fishing conditions are frequently very windy (unless you’re lucky), rain can occur at any time, and temperature variations are significant no matter the month you visit. 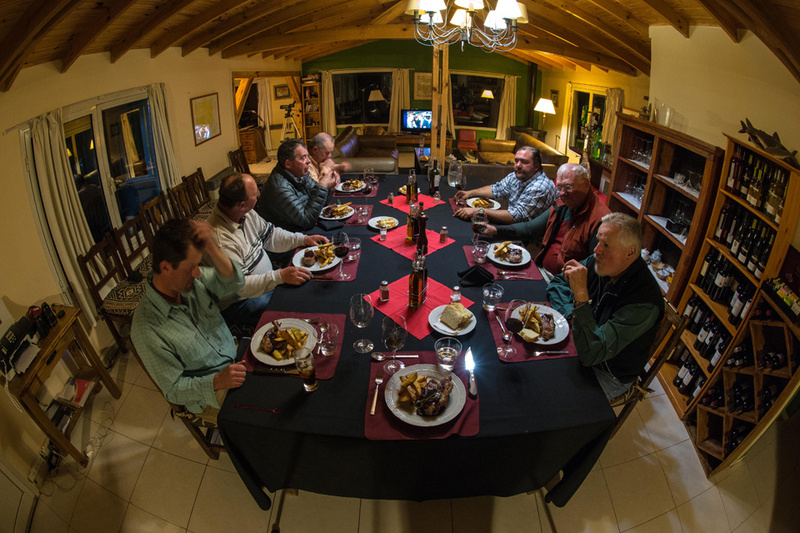 Although fishing is the predominant activity at Estancia Laguna Verde, the lodge can assist in organizing several adventurous non-angling activities in the Calafate area. Calafate is a very popular area for touring nearby glaciers by helicopter, four wheel drive tours, as well as a hotbed for bird watchers. The famous Santa Cruz River is also within reasonable driving distance for those who are interested in this new and exciting Steelhead fishery. Guided fishing; Meals; All beverages including Argentine wines and cocktails; Ground transportation to/from Calafate, Argentina; Fishing Licenses. Tailwaters Travel must adhere to the cancellation policies of the guides, outfitters and lodges which it represents. Laguna Verde’s policy follows: A non-refundable fifty percent deposit is due at the time of booking to confirm all reservations. No refunds are given unless a replacement angler can be found. Full payments are required at 60 days from departure. No refunds or credits will be given due to fishing time lost to inclement weather. Refunds of deposits/payments made on credit cards will be charged a 3.5% service charge to fully compensate Tailwaters Travel for all bank charges incurred. Receipt of deposit and/or final payment is acknowledgement that registrant has read and accepts the cancellation, refund and responsibility clauses.